Palpitations for 3 to 4 years. The patient was apparently well until 7 years ago when he started having abdominal distension which was insidious in onset and was gradually progressive. This was soon followed by swelling of both feet. However, he never developed facial puffiness. He was also experiencing fatigue on exertion, although there was no breathlessness any time during this period. He consulted several physicians for these complaints and was initially treated with the provisional diagnosis of chronic liver disease, although there was no history of jaundice, blood in vomitus or stools or any predisposing high-risk behavior. There was no history of a decrease in urine output either. In addition, he reported relief in abdominal distension with diuretics which he had been taking intermittently. He also underwent abdominal paracentesis twice in the early course of the illness. Throughout the course of the illness, he remained in New York Heart Association (NYHA) functional Class II and has never required hospitalization except for paracentesis. Currently, he continues to have mild abdominal distension and pedal edema which worsen with discontinuation of diuretics. For the past 3–4 years, he has been experiencing palpitations which were insidious in onset. He also complains of feeling of increased heart rate at rest that is, aggravated during exertion. These symptoms were intermittent to begin with but are persistent for the past 2 years. The palpitations are irregular in nature and have not been associated with presyncope, syncope or any focal neurological deficit. On direct questioning, he admits to noticing prominent neck pulsations with the onset of these symptoms. He is not on specific medication for these palpitations. There was no history of tuberculosis or treatment with antitubercular therapy in the past. There is no history of chest surgery or trauma either. There is no history of any addiction or drug abuse. He denies the history of similar illness in the family. A 25-year-old boy presented with 7 years history of insidious onset gradually progressing abdominal distension and pedal edema which is controlled at present with the intake of oral diuretics. 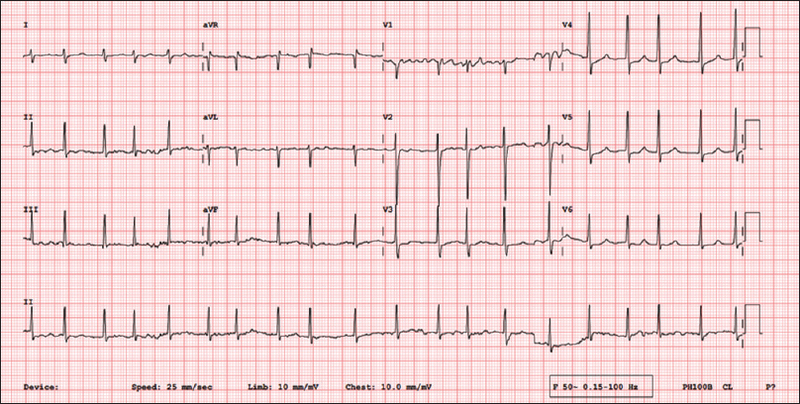 For last 3–4 years, he also has palpitations. 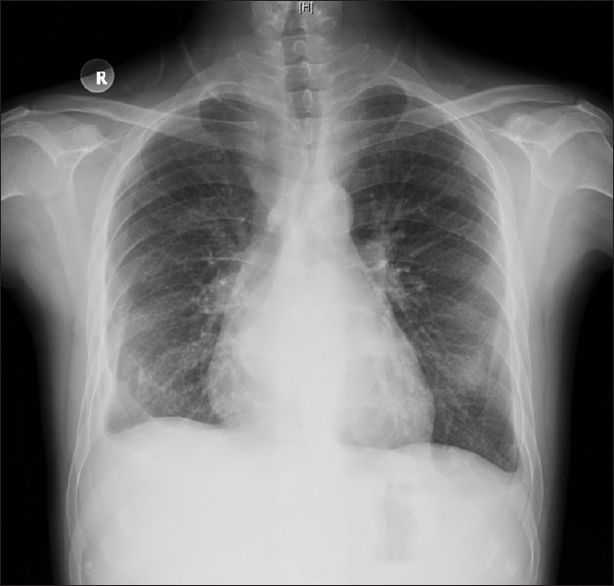 The patient has never experienced dyspnea. The history has been of systemic venous congestion for the past 7 years, followed by the development of tachyarrhythmias likely atrial fibrillation (AF) for the past 3 years. There is no history of tuberculosis or chest infections. In an analysis of the history, I have mainly considered lesions which lead to right-sided congestive failure. In the absence of dyspnea left sided lesions are less likely in the index patient. Although disproportionate ascites is a prominent feature in liver pathologies, it is unlikely, especially considering the absence of other clinical signs of liver failure. Systemic congestion, with a protracted course, with no dyspnea, localizes the pathology to the right-sided chambers. The pattern typically fits in with the pericardial constriction. However, the patient denies the history of tuberculosis, the most common cause of pericardial constriction in India. Myocardial restriction, especially if limited to the right ventricle present with systemic venous congestion with no dyspnea. The clinical presentation of a patient with myocardial restriction is a close mimic of pericardial constriction, and it is difficult to differentiate between the two clinical entities based on the history alone. Organic tricuspid regurgitation (TR) is an important differential diagnosis that closely mimics pericardial constriction in its clinical presentation. Organic TR may occur due to the congenitally abnormal tricuspid valve (TV) or may be acquired. Although rheumatic heart disease is the most common cause of acquired TR, it almost always coexists with mitral valve and aortic valve pathology. Endomyocardial fibrosis (EMF) is an important cause of isolated TR. As mentioned before, this mimics very closely to the pericardial constriction. Although EMF has a unique geographical pattern of epidemiology with most of the cases seen in coastal districts of South India, especially Kerala; however, occasional cases are seen in other parts of the country as well. I would consider EMF as less likely possibility in the current case in view of its peculiar distribution and decreasing occurrence in the recent past. Other causes of organic TR include TV prolapse, carcinoid syndrome, trauma, dilated cardiomyopathy, infective endocarditis (IE), or following surgical excision of the TV in patients with IE unresponsive to medical management. The possibilities of pulmonary artery hypertension (PAH) and pulmonic stenosis are remote due to the prolonged and relatively benign course of the illness. In idiopathic PAH, patient survival is generally limited by the onset of overt right-sided heart failure. How many times do you get pericardial constriction without an underlying cause such as tuberculosis or radiation? Idiopathic chronic constrictive pericarditis (CCP) accounts for 24–61% of cases in Indian studies, depending on the criteria used to diagnose tubercular CCP. Tuberculosis remains a common cause of CCP in developing countries, with a reported incidence of 38–83%. Further, it is not uncommon to see a case of CCP without a prior history of tuberculosis and, therefore, I would consider that it may still be related to the tubercular pericarditis in the past. The etiology of the CCP in the Western World has now undergone a significant change, with the leading identifiable causes of CCP being cardiac surgery and radiation therapy, besides viral pericarditis. What is the common mode of presentation in a case of constrictive pericarditis? Exertional dyspnea and ascites are the most common clinical manifestations and are seen in three-fourth of patients. Pedal edema is seen in nearly half while fatigue is the presenting symptom in one-fourth of patients., Less commonly, gastrointestinal symptoms like anorexia, abdominal fullness, or abdominal pain may develop secondary to ascites. A mechanical constriction around the heart produces gross signs of right heart failure without severe dyspnea, differentiating it from that of right heart failure due to valvular or myocardial disease. However, generally patients with CCP are not free from dyspnea on exertion. Exertional dyspnea in these patients is the result of limited or no increase in cardiac output with physical exertion. Orthopnea and paroxysmal nocturnal dyspnea are exceedingly rare in CCP. What is ascites precox and what is the underlying mechanism? One hypothesis attributes this classical symptom to the selective, partial constriction of at least one of the hepatic vein as it enters the right atrium, the entry point being delicately close to the junction of inferior vena cava and the right atrium. This constriction around hepatic vein might increase the hepatic venous pressure and result in ascites much earlier than in other causes of elevated right atrial pressure. Is ascites precox an exclusive symptom of constrictive pericarditis? Not necessarily so. Even though, it was first described in this condition, any predominant right sided failure like organic TV regurgitation or right ventricular (RV) cardiomyopathy can result in significant ascites which may precede pedal edema. It is in these conditions where it occurs without proposed constriction of the hepatic veins as has been proposed and, therefore, the mechanism of this interesting clinical entity remains unclear. Can a patient with constrictive pericarditis survive without treatment for 7 years? In other words, what is the natural history of CCP? Yes, in a series from the presurgical era  it has been reported that a patient may live for 5–15 years with a low sodium diet, diuretics and periodic aspiration of ascitic fluid. However, there is a general trend toward gradual deterioration. On examination, the patient is thin built with a body mass index of 17.8. He is afebrile. The pulse rate is 74 beats/min. The pulse is irregularly irregular with apex pulse deficit of 20 bpm. No pulsus paradoxus is noted. The blood pressure is 106/72 mmHg in the right upper limb and 108/72 mmHg in the right lower limb. There is bilateral lower limb pedal edema with thickening and pigmentation of overlying skin suggestive of chronic edema. The jugular venous pressure (JVP) is raised to above 14 cm above the sternal angle in the sitting position with absent “a” wave and prominent “y” descent. There is no pallor, icterus or lymphadenopathy. The oxygen saturation by pulse oximetry is 100%. There are no peripheral signs of chronic liver disease. The precordium is symmetrical with no deformity or bulge. The apex is visible in the fifth intercostal space about 1 cm medial to the midclavicular line. On palpation, the apex is tapping and is of a left ventricular (LV) type. There is no parasternal heave. On auscultation, the first and second sounds are normal. There are no third or fourth heart sounds, ejection clicks or opening snap. There is no pericardial knock. No murmur is heard. The abdomen is soft. The liver is palpable 4 cm below the costal margin. The liver dullness is in the 5th right intercostal space, and the liver span is 14 cm. The liver is non-tender and non-pulsatile. Shifting dullness is presented suggestive of ascites. The spleen is not palpable. CHF (−): I would still like to keep the differential diagnosis of restrictive cardiomyopathy possibly limited to the RV since some of the clinical findings are not consistent with the diagnosis of CCP. What are the key findings in the clinical examination that could have avoided the misdiagnosis of chronic liver disease in the early course of the illness? Common findings with more severe constriction include peripheral edema, ascites, pulsatile hepatomegaly and pleural effusion all of which may lead to the misdiagnosis of chronic liver disease. An important distinguishing feature is that, in patients with cirrhosis, the jugular pressure is normal or only slightly elevated, unless there are tense ascites. On the contrary elevated JVP is a universal feature present in 100% of patients with constrictive pericarditis. In addition, the absence of any clinical sign of chronic liver failure makes it extremely unlikely. In how many patients with constrictive pericarditis, is pericardial knock observed? A pericardial knock is an accentuated third heart sound that may sometimes be palpable. Although discussed quite frequently in the context of CCP it is described in only 36–46% of cases in different clinical series. What are the differentiating features between constrictive pericarditis and restrictive cardiomyopathy that one should look for at the bedside? A late S3 and in some cases S4 during diastole and a mitral or TR murmur, are subtle signs that point towards restrictive cardiomyopathy. A pericardial knock may be heard on auscultation in patients with constrictive pericarditis. Patients with constrictive pericarditis are more likely to have pulsus paradoxus and a positive Kussmaul's sign. Pulsus paradoxus is usually absent in patients with more advanced restrictive cardiomyopathy as a result of a noncompliant septum that compromises ventricular interdependence. However, it may be seen in patients with constrictive pericarditis because of the interventricular septal displacement toward the left ventricle during diastole, thus impeding LV filling. However, it is still difficult to differentiate between the two based on the history and examination alone. What would be the preferred first investigation out of electrocardiogram and X-ray chest? The diagnosis of AF is quite obvious on clinical examination and therefore electrocardiogram [Figure 1] is expected to add very little to the diagnosis. It shows AF but does not show low voltages which would have been helpful in making a diagnosis of CCP. I would, therefore, prefer to look at the chest radiograph. If the radiographs show pericardial calcification, the diagnosis of CCP is essentially established. Cardiothoracic ratio is normal. There was no PVH or PAH. No pericardial calcification is seen [Figure 2]. What is the prevalence of pericardial calcification on chest X-ray in constrictive pericarditis? Calcification of the pericardium, though strongly suggestive of constrictive pericarditis is seen in only 25% of patients with constrictive pericarditis. It is best seen from a lateral view and located over the RV and diaphragmatic surfaces of the heart. Pericardial calcification is associated with a longer duration of the constrictive process. However, its absence does not exclude the diagnosis of CCP. A higher perioperative mortality, but the same long-term survival. What is the prevalence of AF in constrictive pericarditis? AF is seen in about 30% of patients with constrictive pericarditis. AF is much more common in those with calcification and longer duration of the disease. The inferior vena cava is dilated with no inspiratory collapse [Figure 3], [Figure 4], [Figure 5], [Figure 6]. Though not shown in the images, the pericardium was thickened. There was mild biatrial enlargement. There was no AV regurgitation, and biventricular systolic function was normal. Septal bounce was present. Respiratory variation of ≥25% in the mitral inflow E velocity and increased hepatic vein diastolic flow reversal with expiration is shown present. 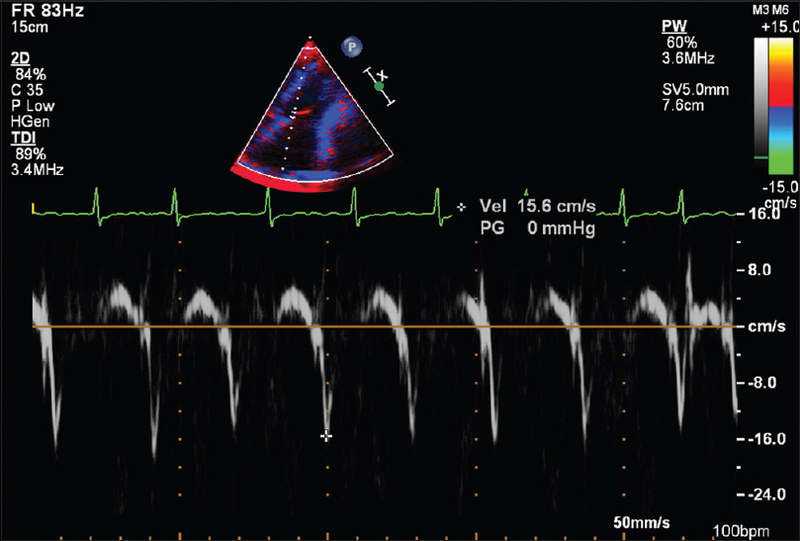 Tissue Doppler imaging (TDI) shows an increased TDI annulus E′ velocity thereby ruling out restriction. Figure 3: Echocardiogram showing dilated inferior vena cava. 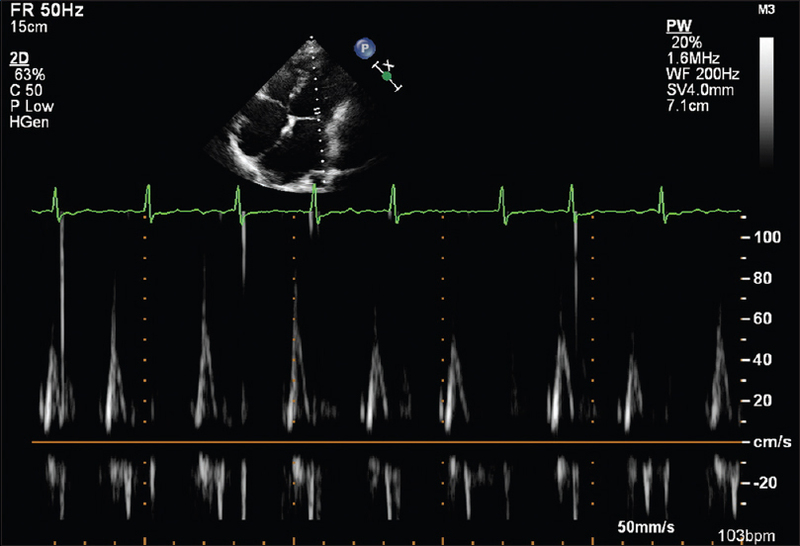 Figure 4: Echocardiogram: Mitral valve inflow doppler respiratory variation. 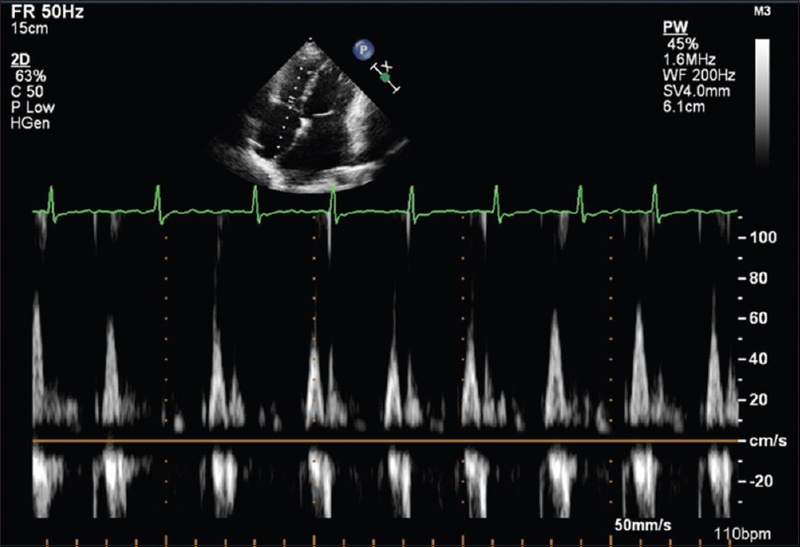 Figure 5: Echocardiogram: Tricuspid valve inflow doppler respiratory variation. 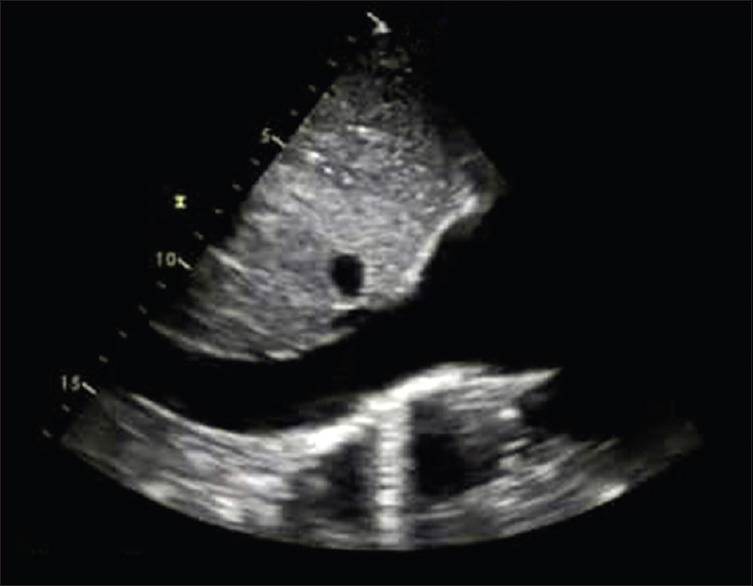 Figure 6: Echocardiogram: Tissue Doppler image: Mitral medial annulus. What is the definition of pericardial thickening on echocardiography? Pericardial thickness ≥4 mm on transthoracic echocardiography has been defined as thickened pericardium. What is “annulus paradoxus” and “annulus reversus”? In constriction, there is an inverse correlation between E/E′ and LV filling pressures. This is in contrast to the positive correlation between E/E′ and LV filling pressures in patients with a myocardial abnormality. Hence, the term “annulus paradoxus“ is proposed to describe the paradoxical behavior of the mitral annulus in CCP. This is attributed to the preserved or even accentuated E' in constriction despite increased filling pressures. Normally the lateral E' velocity is higher than the medial E' velocity. In constrictive pericarditis, this relationship is reversed, resulting in annulus reversus. This is attributed to the tethering of the lateral annulus to the adjacent fibrotic and scarred pericardium. In a patient with preserved mitral E' velocities (≥8 cm/s) and a low E/E' ratio (<8), the recognition of annulus reversus points toward the diagnosis of constrictive pericarditis. Would you like to do a cardiac catheterization or would you prefer an imaging modality like computed tomography (CT) or magnetic resonance imaging (MRI)? What is the pulmonary wedge pressure? Since in this particular case, there is no ambiguity in the diagnosis of constrictive physiology on echocardiogram we will proceed to do CT or MRI to look for the extent of pericardial thickening and calcification [Figure 7]. 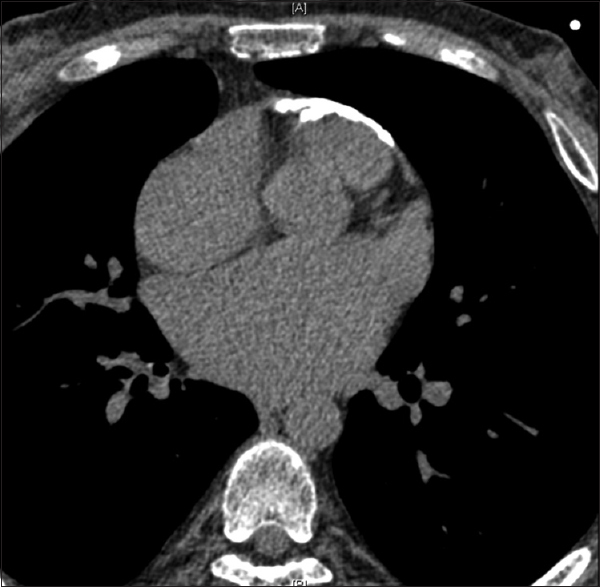 Figure 7: Computed tomography chest showing pericardial thickening and calcification. The wedge pressure is same as the RA pressure which in this case can be estimated from the JVP. How will an imaging modality add to the diagnosis if the echocardiographic findings are unequivocal? Both cardiac CT and cardiac magnetic resonance (CMR) provide a comprehensive anatomic evaluation of the structural characteristics of the pericardium. CT provides detailed images of the pericardium and is especially helpful in detecting even minute amounts of pericardial calcification. However, CMR has the unique advantages of providing high-quality tissue characterization along with functional information and is useful in differentiating this condition from restrictive cardiomyopathy. Both investigations will provide information about the myocardial involvement by fibrosis which can affect surgical outcomes. In addition, these modalities may help in delineating the underlying etiology of constriction. What percentages of patients with constriction have normal pericardium on CT? In a series from the Mayo Clinic normal thickness of the pericardium was reported in 18% of 143 patients with constriction. These patients most commonly had postsurgical and postradiation CCP. 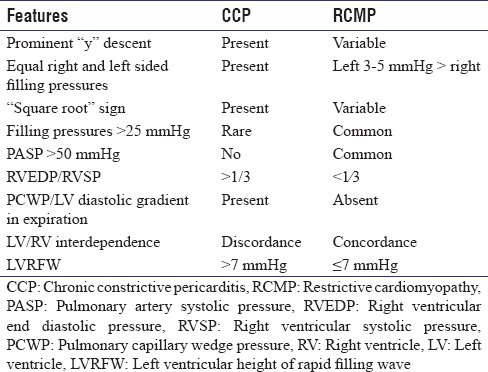 Enumerate the criteria for the diagnosis of CCP on cardiac catheterization. Ventricular interdependence as demonstrated by systolic area index (SAI) >1.1*. *The SAI is then calculated as the ratio of RV area (mmHg × s) to the LV area (mmHg × s) in inspiration versus expiration. What are the features on catheterization that enable differentiation of constriction from restriction? What is the final diagnosis? How will you manage this patient? Definitive treatment is primarily surgical (i.e., pericardiectomy). Diuretics should be used cautiously to improve pulmonary and systemic venous congestion until surgery. Subacute constrictive pericarditis may respond to steroids if treated before pericardial fibrosis occurs. Any therapy directed toward the causative disease (e.g., antituberculosis medication) is appropriate. In this particular case, since pericardial constriction is established he should undergo pericardiectomy as soon as possible. What are the outcomes of pericardiectomy? In an Indian series of 395 patients undergoing pericardiectomy, operative and late mortality rates were 7.6% and 4.9%, respectively. The actuarial survival was ~84% in patients undergoing total pericardiectomy compared to ~74% in patients undergoing partial pericardiectomy at a mean follow-up of 18 years. The majority of survivors remained in NYHA Class I/II. Constrictive pericarditis is the result of an inflammatory process leading to the formation of a thickened fibrosed pericardium that limits diastolic ventricular filling. Recognition of this entity is especially important in view of the fact that this particular cause of diastolic heart failure can be cured with pericardiectomy. Constrictive pericarditis is more common in men than women (overall male-to-female ratio 2:1) and is usually diagnosed in the second to fourth decades. The loss of pericardial compliance in constrictive pericarditis leads to restricted ventricular filling which necessitates the elevation of atrial and ventricular pressures to maintain cardiac filling and output. As a result, there is abnormal rapid filling of the ventricles during early diastole followed by abrupt cessation of flow in mid-diastole, when the intracardiac volume reaches the limit set by the stiff pericardium. This leads to systemic venous congestion and reduced cardiac output. The contractile function is preserved in “pure” constriction, although ejection fraction can be reduced as a consequence of reduced preload. The chronic inflammation and fibrosis may occasionally involve the myocardium, leading to true contractile dysfunction. The response to pericardiectomy is poor in such cases. In healthy individuals, the changes in intrathoracic pressure with each phase of respiration are fully transmitted to the intracardiac cavities. In constrictive pericarditis, the noncompliant pericardium insulates the cardiac chambers from these changes. The extrapericardial components of the vena cavae and pulmonary veins however are still subjected to these intrathoracic pressure changes. Failure of transmission of intrathoracic pressure changes during respiration to the cardiac chambers is an important contributor to the pathophysiology of constrictive pericarditis. On inspiration the pressure difference between the pulmonary veins and left atrium that normally drives left heart filling is reduced, resulting in decreased left atrial and transmitral inflow, with opposing changes between the vena cavae and right ventricle. The inspiratory decrease in LV filling allows an increase in RV filling and an interventricular septal shift to the left. This ventricular interdependence is a hallmark hemodynamic feature of constrictive pericarditis. The opposite sequence occurs with expiration. In restrictive cardiomyopathy as the cause of diastolic heart failure, this differential ventricular filling does not occur. Compatible with the pathophysiology, an echocardiographic diagnostic algorithm has been proposed. Constriction or restriction is likely to be present when a dilated inferior vena cava is present in association with mitral E/A ratio exceeding 8. The presence of abnormal septal motion with preserved or increased mitral annular E' points toward constriction. The presence of annulus reversus makes constriction most likely, and diastolic hepatic vein flow reversal during expiration is diagnostic. The catheterization findings have already been discussed. In summary, constrictive pericarditis is a curable cause of diastolic heart failure. Clinical evaluation including history and physical examination play an especially important role in reaching the diagnosis. Kothari SS, Roy A, Bahl VK. Chronic constrictive pericarditis: Pending issues. Indian Heart J 2003;55:305-9. Wise DE, Conti CR. Constrictive pericarditis. Cardiovasc Clin 1976;7:197-209. Schiavone WA. The changing etiology of constrictive pericarditis in a large referral center. Am J Cardiol 1986;58:373-5. Somerville W. Constrictive pericarditis. With special reference to the change in natural history brought about by surgical intervention. Circulation 1968;38 1 Suppl:102-10. Fowler NO. Constrictive pericarditis: Its history and current status. Clin Cardiol 1995;18:341-50. Ling LH, Oh JK, Breen JF, Schaff HV, Danielson GK, Mahoney DW, et al. Calcific constrictive pericarditis: Is it still with us? Ann Intern Med 2000;132:444-50. Rezaian GR, Poor-Moghaddas M, Kojuri J, Rezaian S, Liaghat L, Zare N. Atrial fibrillation in patients with constrictive pericarditis: The significance of pericardial calcification. Ann Noninvasive Electrocardiol 2009;14:258-61. Pepi M, Muratori M. Echocardiography in the diagnosis and management of pericardial disease. J Cardiovasc Med (Hagerstown) 2006;7:533-44. Talreja DR, Edwards WD, Danielson GK, Schaff HV, Tajik AJ, Tazelaar HD, et al. Constrictive pericarditis in 26 patients with histologically normal pericardial thickness. Circulation 2003;108:1852-7. Doshi S, Ramakrishnan S, Gupta SK. Invasive hemodynamics of constrictive pericarditis. Indian Heart J 2015;67:175-82. Chowdhury UK, Subramaniam GK, Kumar AS, Airan B, Singh R, Talwar S, et al. Pericardiectomy for constrictive pericarditis: A clinical, echocardiographic, and hemodynamic evaluation of two surgical techniques. Ann Thorac Surg 2006;81:522-9. McCaughan BC, Schaff HV, Piehler JM, Danielson GK, Orszulak TA, Puga FJ, et al. Early and late results of pericardiectomy for constrictive pericarditis. J Thorac Cardiovasc Surg 1985;89:340-50. Ling LH, Schaff HV, dal-Bianco J, Barnes ME, Lahr BD, Sundt TM, Oh JK. Detection of constrictive pericarditis: A single-centre experience of 523 surgically confirmed cases. J Am Coll Cardiol 2009; 53(10 Suppl 1):A176. Bashi VV, John S, Ravikumar E, Jairaj PS, Shyamsunder K, Krishnaswami S. Early and late results of pericardiectomy in 118 cases of constrictive pericarditis. Thorax 1988;43:637-41. Syed FF, Schaff HV, Oh JK. Constrictive pericarditis – A curable diastolic heart failure. Nat Rev Cardiol 2014;11:530-44.